Do you need snow tires on your bicycle? Are you always too cold in the winter and too hot in the summer? When you reach a point in life when you are no longer responsible for children, when you have worked enough years and want to do something else, take a close look at Jupiter, Florida. Located in Palm Beach County, Jupiter is an historic and beautiful place to live. Palm Beach County and Jupiter offer all the modern amenities to make your life a dream. Warm summers, warm winters, modern shopping, parks and beaches, wildlife areas, and the list goes on. Jupiter is the 9th Happiest Seaside Town in America according to Coastal Living Magazine. What might your morning conversation be like here in paradise? Does that sound good? Sunshine, cool breezes, the smell of the ocean, the intense colors of a tropical garden, flowers all year round. Does that sound like paradise? And, don’t forget to stop at the Farmers’ Market for all the wonderful fresh-picked fruits and vegetables. Whether it is the 4th of July or Christmas Eve, there is always wonderful produce, salad greens, citrus fruit, melons, you name it, Jupiter has it in abundance. Everyday living in Jupiter is like being on vacation. So many exciting things to do, places to go, people to see, museums, historic lighthouses, how many more can you think of? Jupiter has it all and more. Jupiter’s history goes back to the prehistoric times when the Native Americans hunted and fished in this area. There is a wonder collection of prehistory artifacts to see. Stop at the Hibel Museum of Art, the Chandler Gallery or the Lighthouse Art Center for a sampling of the art world in Jupiter. Are you an outdoors lover? Check out Busch Wildlife Sanctuary, Riverbend Park, North Jupiter Flatwoods Natural Area, Limestone Creek park or Cypress Creek for wildlife and birds. You can add birds to your lifetime list that you can’t find anywhere else, and they are abundant. Birds like Cormorants, Red Tailed Hawks, and of course Pelicans will be just a few that will excite you and give you opportunities for great photography. And how about alligators? Florida is famous for them and you can spot a lot in Jupiter and the surrounding area. They won’t bite or scare you off because; frankly they are a little lazy. But then, you would be too, if you lived in a paradise like this. How about that bicycle with the snow tires? Bring it with you but lose the snow tires. There in a wonderful new Jupiter Riverwalk where you can ride for the full 2.5 miles, see many of the important landmarks and scenery of the area. Or, you can walk the trail, enjoying the wildlife and birds as well as the luxurious flowers, trees and shrubs, many of which bloom almost year round. Where can we live? There are homes, apartments and town houses for everyone. Communities like Tierra Del Sol offer beautiful town houses on the Riverwalk. Other neighborhoods offer a variety of styles and price ranges. It really is a matter of take your choice. Would you like something on the beach, or on the Loxahatchee River or the Riverwalk? Do you want a small bungalow or an estate? Something in a small quiet neighborhood or close to the entertainment district? Ranch style or high rise? The choice is yours since they are all available in the Jupiter area. There are homes for every family and for every taste and budget. Do you want a pool with that? Extra bedrooms for the kids when they visit (and be sure, they will want to every year). 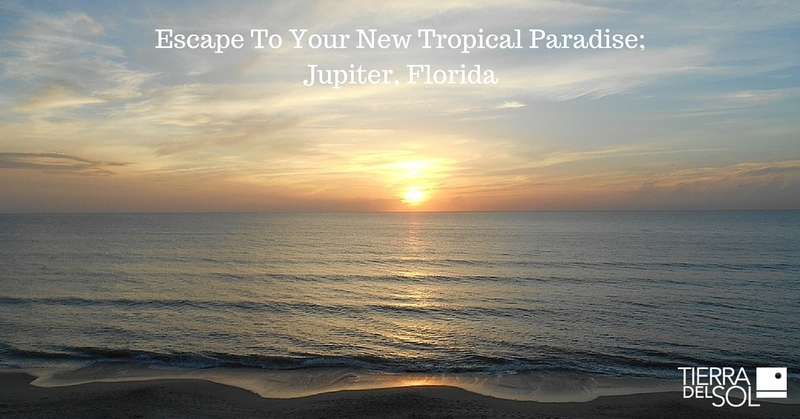 There are a few more things that make Jupiter a wonderful place to live and to retire. Remember that bicycle with the snow tires? Don’t need that here. Heavy coats in the winter, and waterproof boots? Don’t need them either. You don’t have to shovel sunshine off your driveway and you won’t skid your car into a bank of warm sun. Get out your sunglasses, a floppy hat and sunscreen. Dress for the climate during the day; shorts, swim suit, light top or a beach set. At night, trade for more formal attire to go out to the clubs and theaters. But leave the neckties at home, or find some other creative way to put them to good use, maybe decorating lampshades. Life in Jupiter is different and so tropical. Just think of spending your life here.